Musculoskeletal tissue injuries and degeneration are common and debilitating for a high number of patients (Brooks, 2006). Unfortunately, endogenous musculoskeletal tissue regeneration is limited in many cases and may be affected by inflammation and the degree of damage. For example, most fractures of long bones heal spontaneously, whereas large segmental defects fail to heal. Additionally, although articular cartilage has almost no intrinsic reparative potential, tendons and ligaments may heal, but often with inferior properties. The high prevalence of these injuries has led to significant investment in the development of new therapies to enhance healing and augment current surgical interventions. Often the goal is to mimic and recapitulate the natural healing cascade and developmental process by transplantation of tissue-specific stromal and progenitor cells or by endogenous manipulation to enhance the native repair capacity of cells. There has been a continuing increase in the number and type of stem and stromal cells being pursued in human clinical trials for treatment of musculoskeletal injuries (Steinert et al., 2012). Most approaches in this area are based on ex vivo-expanded mesenchymal stromal cells (MSCs) derived from bone marrow (BM). Originally identified and characterized by their multilineage differentiation potential in vitro, multipotent capabilities of MSCs in vivo have not been clearly demonstrated to date, particularly because of the lack of methods to identify and define differentiated populations (Nombela-Arrieta et al., 2011). Central to recent progress in the field has been the understanding that stem and progenitor functions of MSCs may not be the key attribute that mediates tissue repair. In addition, there is outstanding controversy over the terminology of exogenously supplied MSCs as stromal cells, and various terms, including medicinal signaling cells, have been proposed to more accurately reflect their therapeutic function in vivo(Caplan, 2017). Nevertheless, the therapeutic benefit of these cells has been largely explored. Significant advances have been made in developing strategies that deliver, protect, and recruit stem cells, and the bioengineering field is evolving to improve current surgical techniques. This review first describes current treatments and reports the recent progress in clinical investigations of stem and stromal cell-based therapies for musculoskeletal repair with a particular focus on bone and fibrocartilaginous tissues. The current understanding of appropriate cell sources and delivery strategies is then illustrated toward endogenous repair of musculoskeletal tissues. Last, emerging therapeutic concepts are highlighted in the context of biomaterials as a particularly attractive tool to control stem and stromal cell behavior both ex vivo and in vivo, to recruit endogenous stem cells, and to control the local healing environment. 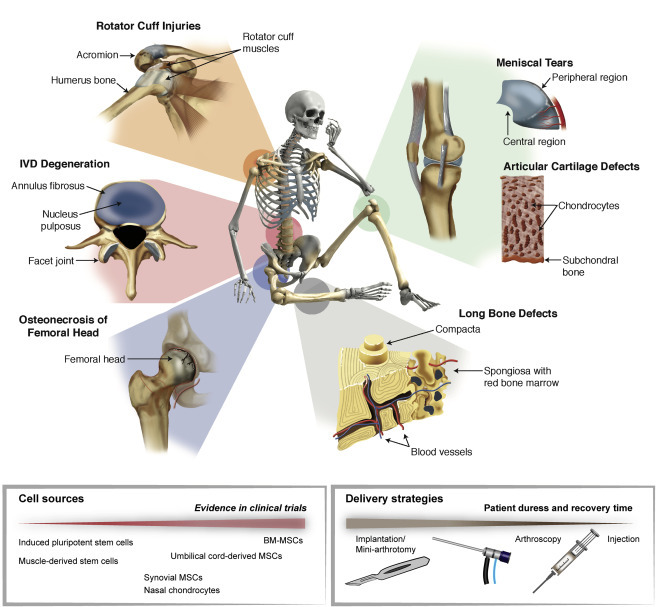 Such approaches have great potential for future therapies in musculoskeletal repair. The intrinsic repair of bone defects mirrors many events of embryonic development and makes fracture healing one of the rare postnatal processes that are regenerative and can ultimately restore damaged tissue to its pre-injury structure, composition, and biomechanical function (Figure 1). In spite of the unique capacity of bone to heal, a number of clinical indications remain where therapeutic intervention is required. In the case of complex trauma with multiple fractures, infections, and tumor-associated and endocrine diseases (e.g., diabetes, osteoporosis), the body’s natural healing response is impaired, and non-union can occur in up to 15% of cases (Grayson et al., 2015). Another debilitating disorder is non-traumatic avascular osteonecrosis, which can lead to collapse of the femoral head and accounts for 10,000–20,000 total hip replacement surgeries in the United States per year (Figure 1; Moya-Angeler et al., 2015). Autologous bone grafting represents the gold standard for management of bone defects and non-unions, and union rates of more than 90% have been reported using iliac crest bone. However, considerable donor site morbidity and limited volumes must be taken into consideration. Additionally, allogeneic or synthetic bone substitutes, such as ceramics, corals, or polymer-based materials, have not reached the biological and mechanical properties equivalent to autologous bone (Table 1). In addition to direct traumatic injury, complex damage of bone tissue (e.g., open fractures, tumor ablations) often results in concomitant soft tissue injury, including adjacent muscles. Although skeletal muscle has the inherent ability to regenerate after injuries, the regenerative capacity fails when a large volume of muscle is lost (i.e., volumetric loss). Such severe injuries may lead to fibrosis, atrophy, and ischemia when left untreated, accounting for significant socioeconomic costs ($18.5 billion in healthcare costs are associated with sarcopenia alone) (Janssen et al., 2004). Therapeutic treatment options are limited to physical therapy, scar tissue debridement, and transfer of healthy, innervated, and vascularized autologous muscle tissue. However, the outcomes of surgical reconstructions often remain aesthetically and functionally deficient (Grogan et al., 2011; Table 1). In contrast to bone and skeletal muscle tissue, the poor intrinsic healing capacity of articular cartilage and meniscus tissue presents a major challenge in clinics. Lesions from injuries or degeneration often result in gradual tissue erosion, leading to impaired function of the affected joint and degenerative osteoarthritis (OA) (Figure 1). Patients with post-traumatic OA account for more than 10% of the 27 million adults in the United States that have a clinical diagnosis of OA (Johnson and Hunter, 2014). Commonly, the first-line treatment of articular injuries includes arthroscopic lavage, partial meniscectomy, and BM stimulation techniques to penetrate subchondral bone (Table 1). Microfracture has been considered the gold standard for stimulating endogenous repair; however, it often results in the formation of inferior fibrocartilaginous repair tissue. This cartilaginous tissue is vulnerable due to altered biomechanics of the subchondral bone, which raises concerns about the long-term efficacy of microfracture (Solheim et al., 2016). Therefore, secondary and more complex procedures strive to restore the hyaline cartilage, such as osteochondral autografting from the less weight-bearing periphery (mosaicplasty) and autologous chondrocyte implantation (ACI). ACI represents one of the first clinical applications of tissue engineering where a biopsy from a low-weight-bearing region is performed, and ex vivo-expanded chondrocytes are implanted in a second operation. The de-differentiation of monolayer expanded chondrocytes and potential of recovery when implanted has been a matter of debate, and matrix-based ACI techniques have been developed that use absorbable scaffolds (e.g., porcine collagen) to support the implanted cells (Makris et al., 2015). An important limitation of these techniques is the long recovery time (6–12 months) to ensure neotissue formation. The choice of articular injury treatment depends on several factors, including localization and size of the lesion, the level of activity, and the degree of associated damage of menisci and ligaments. Tears of the fibrocartilaginous menisci require surgical intervention for nearly 1 million patients in the United States annually (Vrancken et al., 2013). For lesions located in the peripheral vascularized region of the meniscus, repair strategies such as sutures and anchors allow preservation of the meniscal tissue. However, meniscal lesions often appear in the avascular central regions, which makes them less suitable for healing and usually requires partial or (sub)total meniscectomy (Figure 1; Table 1). In some cases, further treatment with a meniscal substitute, such as an allograft or a synthetic implant, is indicated to limit OA (Vrancken et al., 2013). Another large proportion of musculoskeletal injuries in the clinic is represented by other damaged fibrous structures, including tendons, ligaments, and the annulus fibrosus (AF). Often, degenerative pathology precedes acute trauma, and, like articular cartilage, these tissues have a limited healing capacity. One of the most common tendon injuries presented clinically is tearing of one or more of the interdigitating tendons of the rotator cuff (Figure 1). Failure of initial physical therapy or acute trauma in young patients motivates surgical repair using open or arthroscopic approaches for subacromial decompression, tendon debridement, and suture or anchor supplementation (Table 1). Still, repair is limited, particularly within the complex anatomic arrangement forming the shoulder cuff. The formation of fibrovascular scar tissue frequently leads to significant morbidity, re-ruptures, and difficulties in treatment choice. The intervertebral discs (IVDs) are composed of the nucleus pulposus (NP), a hydrophilic proteoglycan-rich gelatinous core, surrounded by a dense fibrocartilage ring—the AF (Figure 1). The gradual progression of IVD degeneration and the extrusion of the NP through defects in the AF is a major cause for lower back pain, a leading cause of global disability (Sakai and Andersson, 2015). Available treatments are mostly symptomatic, and surgical treatments often resect the structural obstruction resulting from herniation or fuse motion segments (Table 1). However, the complex structural features of IVDs surrounded by neural elements and inflammation frequently cause a homeostatic imbalance favoring a catabolic response governed by the loss of the IVD structure, which is often followed by facet joint arthritis and vertebra deformation, canal stenosis, and even deformations. Most importantly, disc replacement with synthetic implants or fusion of the motion segment does not cure the underlying pathology of IVD degeneration (Sakai and Andersson, 2015).